Posted May 10, 2015 by robshiflet & filed under Blog, FeaturedOnHomePage. So, I get to the show and I’m standing in line for the VIP section with my adorable Ellie Project box filled with the original manuscript of The Ellie Project, our documentary, some stationary, and a note thanking Ellen for making me laugh during a really challenging time in my life. One of The Ellen Show employees announces if anyone has a gift for Ellen to come put it in the box next to her. I go up there, wondering if Ellen will actually receive this gift, but hopeful because only one other person brought one as well (which was a letter). 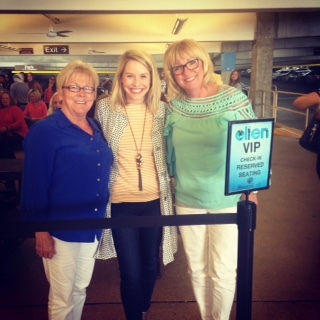 While waiting in line, another Ellen employee approaches my family and tells me she saw my smile from a mile away and figured we were some of Ellen’s biggest fans. Heck, yes, we are! She asks us some questions and I get the opportunity to tell her how Ellen has impacted my life and how I brought her a gift box to thank her. She tells us to meet her in the back of the room, along with about 30 other people. She takes us outside and has us line up, then picks only 10 of us to go back to the “bungalow.” When she gets to me she tells me she loved my story and picks me as one of the 10. Once all 10 of us are in the “bungalow”, she informs us if Ellen plays a game or does a giveaway, one or two of us will be chosen from the audience. Inside I was freaking out. I could not believe this was happening! Before we start the show, we fill out a questionnaire about The Avengers and Chris Hemsworth, so I figure he is going to be the guest that day. Little did I know, I was in for a huge surprise! When I get to the VIP waiting room, my mom tells me she heard Reese Witherspoon is going to be the guest for the day! I about died, because Reese Witherspoon is seriously my all-time favorite actress. We are the same height and I’ve been told she is my doppelganger! I felt like this day couldn’t get any better! Once we get into the studio, we are seated in the third row!! I sit on the end. Twitch (from So You Think You Can Dance?) is our DJ for the day. He gets us pumped up by throwing down on the dance floor and then teaching us some dance moves! Now, you might think since I was a college cheerleader I can bust a move, but you might be wrong. Never in public, only in the privacy of my house ☺ So I’m a little embarrassed about what you might see because I let loose and fully committed to the experience that is The Ellen Show! Jason Derulo performs, Reese Witherspoon and Sofia Vergara are the guests, and Ellen gives away a living room makeover to a sweet family going through a challenging time. Not sure if it is because we may have been running behind (she had two shows to film back-to-back that day and we were the first show), but for whatever reason no one gets chosen to play a game. The show ends and I am left feeling so blessed for the incredible opportunity to come to the show, see Reese Witherspoon, and of course, Ellen! About five minutes into the car ride home I get a call from a Los Angeles number. It’s someone from The Ellen Show! I was so excited! He tells me he got my email (an email I sent prior to coming to the show) about being at the show today and wants to know more about my email and my story. We have a great conversation and he tells me if anything moves forward with my story, he will be giving me a call! …and sending Ellen a note about The Ellie Project. Please title the e-mail, “The Ellie Project/Bailey Heard”. If you have been touched by our story, please write your experience to Ellen. I really appreciate you helping me keep Andrew’s giving and inspirational spirit alive through the books he left behind! You are the best! I will keep you posted! Blessings. P.S. The show airs on Monday, April 13th!! P.S.S Ellie asked me today if she was going to meet Mrs. Ellen. So cute!